Miami defeats Louisville 73-65 / @CanesHoops.. The Miami Hurricanes men’s basketball team defeated the Louisville Cardinals 73-65 Saturday at the BankUnited Center in Coral Gables, Fla. It was senior day at the BUC for the No. 12 ranked ‘Canes, who were playing their second consecutive and final home game of the season. The four seniors honored were guards Angel Rodriguez and Sheldon McClellan, forward Ivan Cruz-Uceda, and center Tonye Jekiri. Louisville displayed their physicality early by scoring 14 of their first 20 points in the paint. Conversely, Miami picked up right where they left off from three-point range against Virginia. Four of Miami’s first five buckets were three-pointers. Three of them came by the way of Cruz-Uceda and Rodriguez, with Davon Reed hitting the fourth. The three-point barrage prompted Louisville head coach Rick Pitino to call a timeout to stop the bleeding. The two teams exchanged buckets for the entirety of the first half. Both the ‘Canes and the ‘Cards shot over 60% in the half, while neither team held a lead of more than five points. It was a rather technically sound half for both teams as well. Only three turnovers were committed by either team. Miami began to crash the low-post to defend shots in the paint. Louisville made the adjustment to pass on their drives to open shooters behind the three-point line. Each three silenced the Miami fans while drawing cheers from the considerable Louisville contingent in attendance. The ‘Canes’ balanced attack saw Reed as the only player to score double-digit points in the first half (10). Five other ‘Canes scored in support. Miami trailed entering the second half for the seventh time this season. Out of those seven games, Miami has managed to mount a comeback in four of them. However, those four games were against lesser opponents Virginia Tech, Pittsburgh, Syracuse, and Princeton. Coming back against Louisville would be a greater challenge. The comeback attempt got off to a slow start. Louisville kept Miami from scoring until the 16:40 mark of the second half. It looked as though Louisville would run away with the game as they pushed their lead to eight, while Miami showed no signs of life on the offensive end of the ball. Hold on a moment! Pump the brakes! Not so fast! During a second half timeout after a stretch in which the ‘Canes miss nine straight shots, Miami coach Jim Larrañaga put the onus on Rodriguez. Rodriguez did just that. Miami scored nine straight points to take the lead, 47-46, seven of which came from Rodriguez. “He was absolutely sensational,” Coach L said. Rodriguez sparked the run when he made a driving layup and got fouled on the play. He put in the free-throw to complete the and-one opportunity. Another layup by Rodriguez and one from Reed drew Miami within one before guard James Palmer finally gave Miami the lead on a double-pump layup. The sold-out crowd at the BUC reached an even higher decibel when a Cruz-Uceda triple re-gave Miami the lead after it was retaken by Louisville. Freshman Anthony Lawrence Jr. brought the crowd to their feet when he made a three shortly after he was subbed-in to the game. As the second half continued it began to resemble the first, with both teams scoring back-and-forth. McClellan had two key plays for the ‘Canes in a two-minute stretch. On one Louisville possession, he knocked the ball out of the hands of a driving Cardinal right to Rodriguez who put in the layup. On Miami’s next possession, McClellan got fouled while putting in a tough layup and made the free-throw to covert the and-one chance. With four minutes left, Jekiri, a career 61% free-throw shooter, made two clutch free-throws to put Miami up one, 63-62. Louisville missed a shot on the other end, prompting a chant of “Let’s go ‘Canes” that resonated through the arena. Two more points were added via free-throw by McClellan with just over a minute remaining to make it a three-point game. Yet another miss by Louisville followed. At this point, the ‘Canes were looking for a knock-out blow. Even with Louisville in a rut, the Cardinals showed their propensity to put together a run several times earlier in the game. Miami need not wait long. The hero of the Virginia game stepped right in: It was Davon Reed, and for three! Davon Reed (#5) hits a crucial corner three for Miami / ESPN. Even still, there were 42 ticks were still left on the clock; Miami was up by an undaunting six. The rim proved to be more daunting to Louisville than the deficit they were facing. Louisville finally ended their cold-stretch by scoring their first basket in nearly five minutes. The shot by Quintin Snider proved to be the last bucket Louisville made. It looked as though the Cardinals succumbed to the pressure while Miami rose above it. The ‘Canes late-game defense was simply incredibly, forcing contested shot after contested shot. The stats tell the same story. Miami held Louisville to 1-12 shooting to end the game while going on a 17-5 run over the final 5 minutes and 21 seconds. Free-throws by McClellan and Reed sealed the deal and gave the ‘Canes another impressive victory. With the win Miami improved to 23-5 (12-4 in ACC play) on the season. The ‘Canes now sit alone in 2nd place in the ACC, a half game behind North Carolina. The ACC has proven to be the toughest conference in college basketball this season. Six ACC teams (including Miami) are ranked in the AP top 25. Miami has beaten four of them (Louisville, Virginia, Notre Dame, and Duke). Miami’s next game is against No. 23 Notre Dame (19-8) Wednesday in South Bend, Ind. The Hurricanes won the first matchup 79-70. 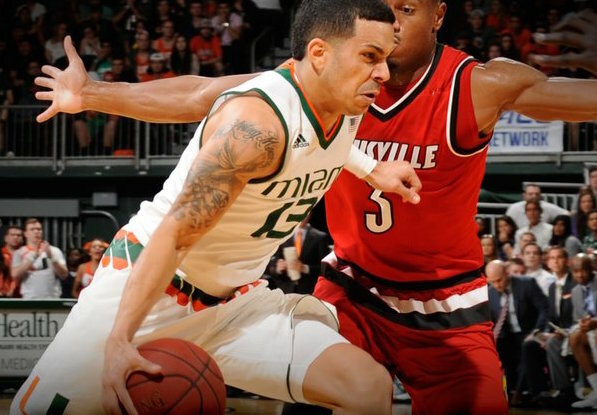 Angel Rodriguez and Davon Reed led Miami in scoring with 17 points, while McClellan added 13. Reed was coming off his career high 21-point game against Virginia. Ivan Cruz-Uceda rewarded coach Jim Larrañaga for giving him the starting nod on senior day by making all three of his three-point attempts. A certain sports writer was on the right track a few weeks ago when he said Miami would need Cruz-Uceda’s three-point shooting later in the season. Tonye Jekiri was two points and two rebounds away from a double-double, but made all four of his free-throw attempts. Miami continued their impressive play at home where they have lost only one game this season (which came on a last-second shot against Northeastern). Miami won its fifth game of the year when trailing to start the second half. Game highlights can be found here courtesy of Hurricane Sports.